Last week we took Jaden to his doctor in Terre Haute. We found a doctor here, but was not satisfied, so we got a second opinion on things. He is healthy, but he might have some asthma issues. We are praying this is not true and that it just turns out to be a virus, but so far he is still coughing with steroids! Now, we are going back to Terre Haute today to celebrate my brother's birthday. I am also going to stop at Kohl's there and check out their shoes. I am not really happy with the Nike Alaris that I bought. The right shoe is rubbing a bone on the top of my foot. So, I will go and try on some others! Does anyone have any running shoe recommendations? I really want to stay under $100. I am thinking of checking out the Asics Gel shoes. I know, you can't really see the collar! This dog is nuts. I couldn't get the picture of it! hahaha!!!! But, doesn't he look handsome? I am going to enjoy my coffee before Jeff comes down and then I am going to get ready! Have a great Sunday! I hope everyone is having a wonderful weekend so far. Mine is going pretty well. Yesterday, I took the kids to the mall and a few other stores. We picked up some new Spring clothes and some birdseed! I just can't wait for Spring, so I figure I will start getting ready for it! 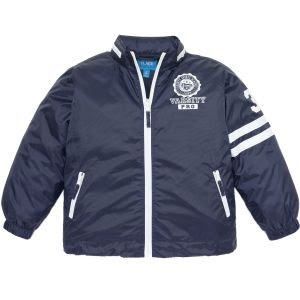 The Children's Place is having an awesome sale on their windbreakers, so Jaden got one for this Spring! They are only $10 right now! Cassidy got a few cute things also! She loves clothes, so it is cool watching her pick out her own things. I love that she in enjoying looking at clothes. She even likes to try them on! After several weeks of needing new running shoes, I finally went out this morning and got a pair! I am so thrilled. I got the Nike Alaris! They fit my Nike+ inside the sole of the shoe! I think these will be awesome. I am wearing them all day today to break them in. I might try a run tonight. I need to get to 5 miles before the end of February. I ran 4 1/2 a week ago! I am going to finish up my day today catching up on laundry and cleaning the house. We might even do some school today! I love that about homeschooling! Happy Valentine's Day. We had a great weekend. We started on Saturday by taking a trip to the mall and making some Vday treats! I took the kids to the Disney Store and they bought each other a stuffed animal. Jaden got another Pooh bear and Cassidy got another Minnie! They just love their animals! Disney had a special, buy one get one free! That is awesome! We also went to Panera Bread and got a treat. I love taking the kids out places! Jaden wanted some pumpkin pie, so we made little pumpkin pie tarts! He loved them! I just love making a big deal out of holidays for the kids! I blew up some balloons and hid some Hershey Kisses all around the house. This morning, they woke up and looked for all of them! They loved this! I will have to do it again next year. We also had our annual heart french toast and the kids got some goodies! Then, we headed to church. The kids gave out some Valentine's there. Cassidy has got the craziest bedhead! Afterward, we picked up our heart shaped pizzas from Papa Murphy's. We just love their pizza! I just love these kids! I hope we have many special Valentine's Days to come before they both find their significant others! Yep, that picture pretty much sums up how I have been feeling the past few days. I haven't gotten much accomplished, but I did paint another chair! That is progress! The kids are also sick, so they haven't been doing much either. We were planning on going to a playdate today, but it is probably not a good day to play around other kids! I do need to get them out of the house though. I think I will stock up on some Lysol when I go to the store. We need to get the germs out of here! I am officially ready for Spring! It is going to start getting busy around here soon. I will be painting the kitchen cabinets in a few days! I can't wait to see the difference! I am still nervous about it. Cassidy thinks the glaze looks like "poop". Of course, that made me feel even better about it. Valentine's Day is almost here and we always do a little celebrating that day. We start attending our small group next week and my brother's birthday party will be the next week! I love family birthday parties. I am so glad that we still do that! March will be busy as we plan for Spring! We plan on putting up a new fence! I can't wait! April brings my birthday and Easter! May brings Cassidy's birthday, our Mall of America vacation, and my Dad's birthday! I can't wait! Let's get this year started already! I decided to paint the dining room table and chairs. I have been wanting to do this for awhile, and I thought it would give me more paint practice before I paint the cabinets. I have one chair done! What do you think? I am still not sure. I might want to go with black. I really can't decide. I finally made some more cupcakes. Nothing fancy, just sportin the blue for the team! I am not a fan of football, but we are heading to a Superbowl Party! Can't wait to chat with the girls and eat some awesome party food! We have snow again! I love when we get a good amount of snow. Don't get me wrong, I am ready for Spring, but I do love a good snow. We probably got around 7 inches yesterday! And, since the wind blew it around, we have several spots over 2 feet! Very cool. I shoveled the driveway yesterday and today. I am hoping to get the kids out one more time to play!